My name is Neil Truelove and I would like to introduce you to my blog on being head boatman on the Upper Norham Castle beat on the river Tweed. It has always been a latent dream of mine, at some stage of my life, to work on the river. However the commitments of owning and running a busy restaurant and inn had always curtailed that. Until this year when a friend of mine asked me if I was interested in the position of head boatman on the Upper Norham Castle beat. The timing was right as my son and business partner Tom was able to take up the baton and run the business with my other partner Brian Orme, so I jumped at the offer without hesitation. I have been very fortunate to be able to fish for salmon for most of my life, and I have had the greatest and respected anglers of our time to learn from. People like Reg Righyni and Arthur Oglesby were a great influence in my early days when we fished on the river Lune together at Newton, but saying that the transformation from angler to boatman has been an eye opener. My disasters came thick and fast, broken oars, snapped sheer pins, and most importantly remembering to get out of the boat on the shallow side. It took me two drenchings to remember this basic rule, and a lesson in how to hide my embarrassment and carry on with my duties with 5 gallons of river Tweed in my waders!! Joking and mistakes put to one side though, I wanted to give back to my guests, some of what has been given to me over the years. I really wanted to show other methods and techniques, and also to get people “fishing” for salmon not just waiting to catch one. Ten years ago now a new company burst on to the scene in the UK with what seemed to be new and radical ideas and products – the company was Guideline. Their products were shooting heads and fast action salmon rods, together they made a few old colonels fall off their bar stools with disgust, but they made us start to think more. I was I suppose broken down and surrendered to trying these new items by Stuart & Vicky Hooley at Fly Only, who by the way have become my very good friends and an inspiration to me. 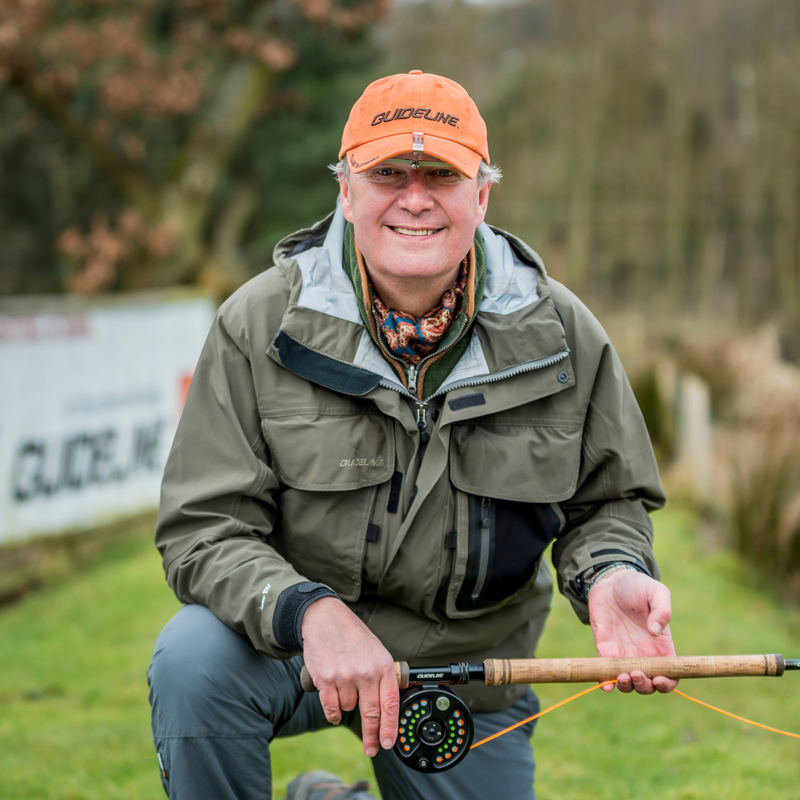 This modern way of Spey casting and fishing was starting to take hold, with the ability to be able to fish areas more thoroughly, cover deeper pools and lies with far more ease. So over the past few years I have always carried with me a good range of Guideline lines and equipment. Earlier this year I was delighted to be asked to join their UK power team by Jim Curry – something I see as an honour not a privilege. Now I can pass on to my guests this advance in our sport and the benefits that come with it. Already the beat is starting to see some changes with people thinking more about presentation and depth, the returns are rising, plus we are seeing a move to keeping fishing with the fly and less reliance on the spinning rod. This week we have been putting the beat to bed for the end of the season, lifting the boats out and moving them indoors to paint and prepare them for next year etc. In my next blog I will cover the depths and speed of the river and relate this into which Guideline shooting head lines that have worked well over the past season and the appropriate flies to use on the beat. « The Fly Dressing Qualification and the Meaning of Life.